If you're planning on leaving Japan, maybe in the next few months, maybe next year, or maybe just "one day" and aren't certain of all the logistics involved, today's interviewee might interest you: Laura Pepper Wu. 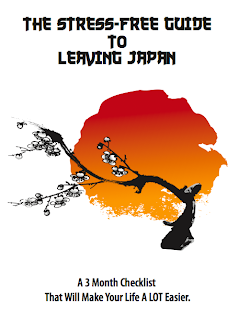 Laura lived in Japan for three years and when she was preparing to leave in 2009, she learned just how much was involved in the arduous process and decided to write an ebook - The Stress Free Guide to Leaving Japan - about the process after all was said and done. Ashley: First of all, can you tell us a little more about you, what you did here in Japan, and what you're up to now? Living in Tokyo was a fantastic experience and completely different from the small farming town I had lived in during JET. I met my now-husband during the six-month internship and we moved to the US together six months later. I currently live in Seattle, WA (Ashley: Washington state, USA) where I help authors market and promote their books through social media, website design and other PR activities. It's not Japan-related, but I learned a lot of transferable skills from my work in Japan. It's creative and I sure enjoy working with an array of authors from different backgrounds. Ashley: How was the process of moving from Japan overall? Laura: Honestly... it was a pretty huge headache. I've moved around a lot before and after Japan, and this move was one of the most stressful. When I try to break down why, it was probably a combination of mixed emotions regarding leaving the country I had grown to love, along with a language barrier and lack of comprehensive information regarding the procedures we had to undergo in order to make the move happen. There was also the uncertainty of what was waiting for me on the other side; was I ready to return to Western culture and how was life ever going to compare to the excitement of Japan? Ashley: What was the most difficult aspect of preparing to leave Japan? Laura: Researching removal companies was hard. Since there was two of us and my husband had bought a lot of furniture, we didn't just want to send back a few boxes of belongings. We did eventually find a great company who shipped all of our stuff and some furniture and took really good care of it. But we received five or six quotes before we got a reasonable one, and this involved having someone come into the apartment and measuring all of our things. So that was pretty time-consuming. Understanding the pension refund process was more confusing than difficult, but that also took time and research to get right. Finally, getting rid of the things we didn't want to send on to the US was more difficult than I had anticipated due to the strict garbage and recycling laws that exist in Japan. In a different vein, saying goodbyes was difficult too - not knowing when you will see friends again who you have been through so much with and got so close to. As is saying "goodbye" to your favorite restaurants, temples and corners of Japan! Ashley: If you had to do it all again, is there anything you would do differently? Laura: There are a few main things that I would recommend. Start early and get rid of your things gradually throughout the months prior to your departure. Be sure to spend some good quality time with everyone that you'll be leaving behind (sayonara parties don't really count!) and use this site: http://intlmovers.com to request quotes from several removal companies at once! Ashley: What did you love most about living in Japan? Laura: Well for sure the same things as most other people: the convenience, the polite people, the trains. But if you want a more extensive list... I love the old people I encountered (especially the Obaachan) and their energy and outlook on life. I adored the people-watching opportunities in Tokyo and drooling over the fashion and well-dressed men and women everywhere. The fact that people are, for the most part, environmentally-conscious (save the conbinis) and don't waste food - the mottainai attitude is fantastic. The work-hard play-hard ethic (or rather the fact the Japanese truly know how to relax) appeals to me. I like the fact you can drink in public - under the cherry blossom or on the way to a club! And I love, love, love the simplicity in the design of bars and restaurants, that mean you can creep off a massively busy street in central Tokyo and yet feel completely at peace and relaxed. Finally, (I could go on), the small details such as the plates and cups your food is served on is breathtaking. Oh, the ceramics... my husband thought I was mad for shipping a whole bunch of ceramics across the ocean, but Japan taught me the value of presenting food in a beautiful way and I still try to honor than now. Ashley: Finally, what tips or advice would you give to SiJ readers about living in Japan? Laura: Oh gosh, you're the authority on this one Ashley!! I would say, make friends with Japanese people. It's the best way to understand the culture and they'll make you fall in love with Japan all over again.